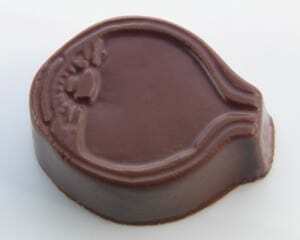 According to research chocolate improves eyesight and sharpen the brain more than carrots. Dark chocolate can lower the blood pressure and also appears to have a good effect on cholesterol levels, platelet function and insulin sensitivity. The authors of the latest research were from England’s University of Reading, including 30 men and women aged between 18 to 25 and perform research on themselves by testing their vision and thinking skills a couple of hours after they ate a dark chocolate bar. Milk chocolate does not produce the same results. One of our perennial favorites is Oliver Peoples. 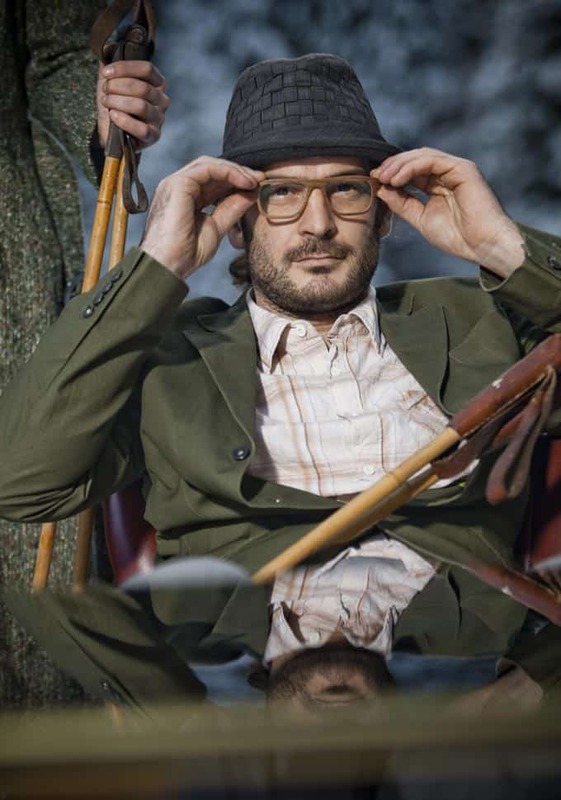 For 25 years now, Oliver Peoples has produced some of the finest eyeglasses and sunglasses in the industry and Europtics is proud to sell the line at all five of our locations. We have customers who come in year after year asking what the newest Oliver Peoples designs look like. Here is a video Oliver Peoples created to commemorate their 25th Anniversary featuring actor Ray Liotta and Israeli model, Bar Paly. 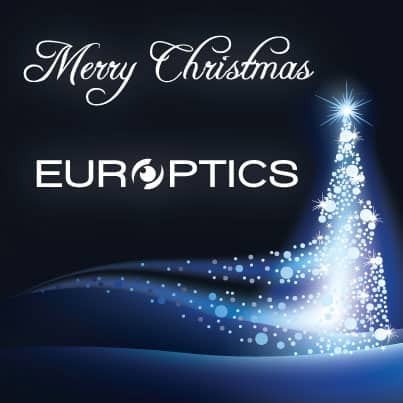 Everyone at Europtics wants to wish you and yours a very joyous, happy, and healthy holiday season. Thank you for letting us be a part of your vision. It’s always fun to capture a great ski day in video. The problem of course, is carrying a video camera, no matter how small, and still be able to ski well, and enjoy the day. You were either skiing, or video taping. Zeal Optics has changed all that, and Europtics is proud to present to Denver the Zeal HD Camera Google. Now you are able to ski the mountain with the intensity you want and still record up to three hours of video at 1080 or 720p. In addition you can take crystal clear 8 megapixel HD still photos too. 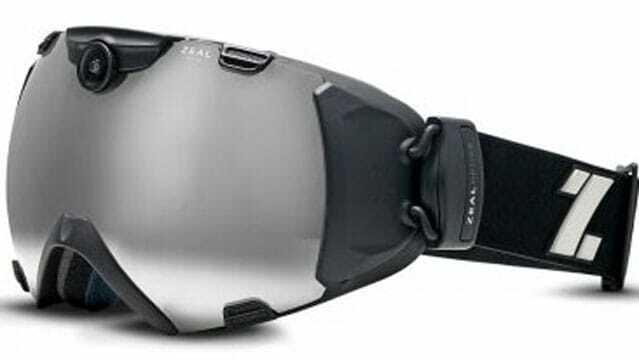 Check out some of the features of the new Zeal google and buy a pair for your super skier this Christmas at Europtics. We take a lot of pride in every pair of eyeglasses and sunglasses we sell. We take a lot of pride in our stores as well. We were humbled recently to learn that we were awarded the 2012 DARE (Design And Retail Excellence) Award for the most Daring Store Design, Retail Environment, Merchandising/and Window Display by our peers in the optical industry for our new Cherry Creek North store. Thank you and a big congratulations to everyone involved. If you haven’t seen our new store or our award winning windows, come down to the new Cherry Creek Europtics at 100 Fillmore Street. Europtics is expanding. Europtics is opening a store in Colorado Springs this fall! 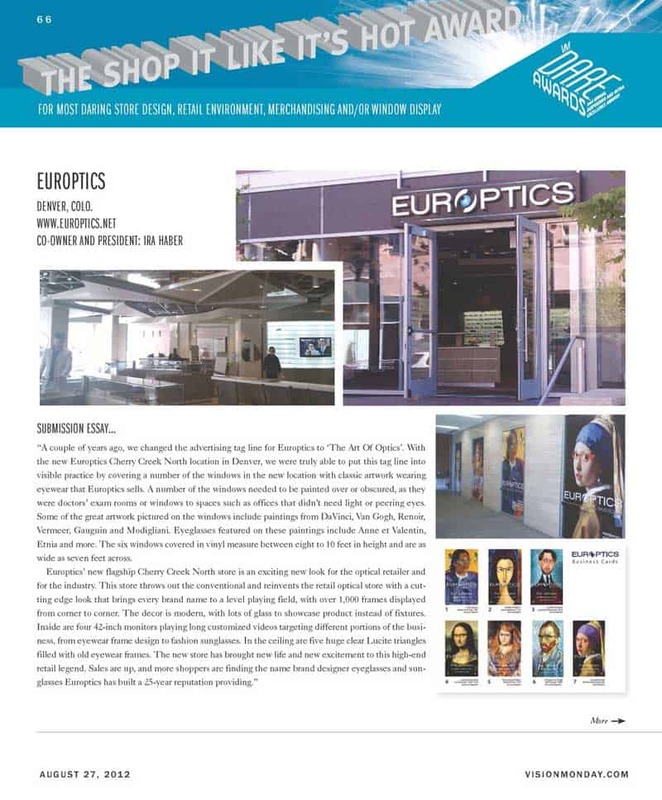 Since Europtics opened over 25 years ago in Denver, thousands of people have made the trip north from Colorado Springs and Pueblo to shop the huge selection of famous name brand designer eyewear available at Europtics. Now the trip will be significantly shorter. The new Europtics store will be in The Promenade Shops at Briargate, 1685 Briargate Pkwy. on the north side of Colorado Springs. 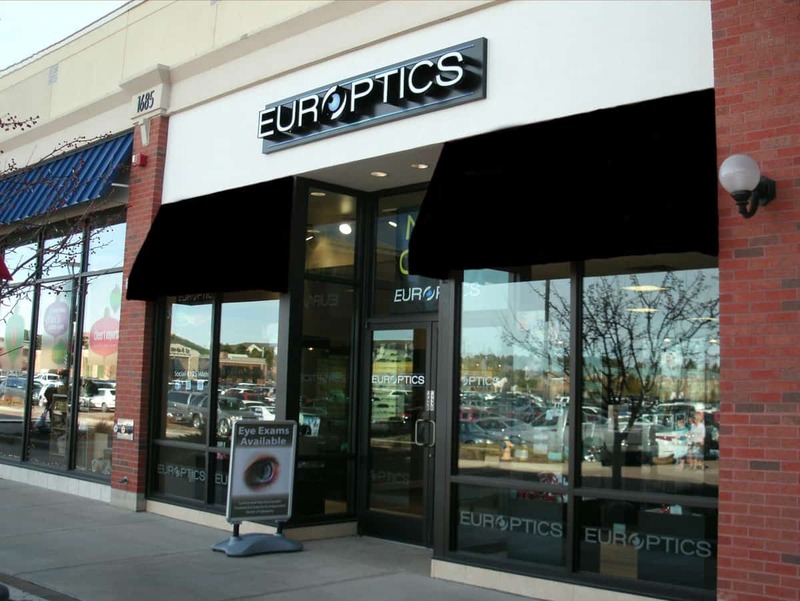 Conveniently located between Ted’s Montana Grill and the Apple Store, Europtics will bring the world of fine designer optics to Colorado Springs. We hope all our southern Colorado friends and customers are as excited as we are. Stay tuned for more details! 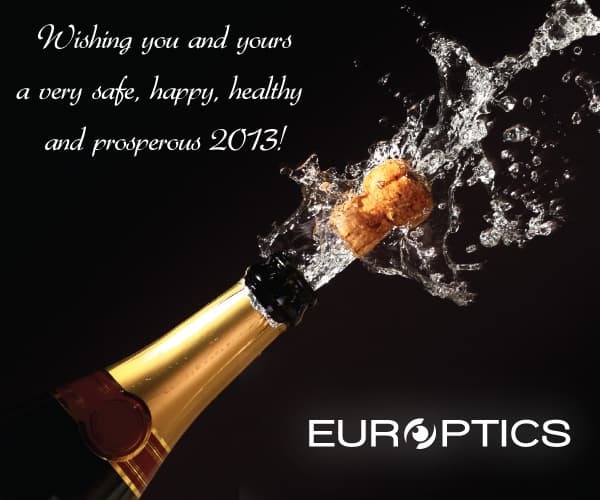 We love being the optical shop vendors from around the world want to showcase their product in. We are proud to announce that we are bringing an exciting to new line of hand-made, lightweight wooded, bamboo and woodstone eyeglass frames to our Cherry Creek North store called ROLF. ROLF eyewear has been winning award after award for design since the company began just a few short years ago. Each pair of handcrafted frames go through 78 working steps in creation taking several hours each. We think when you see these exciting eyeglasses and sunglasses you will be as excited as we are. Stop by Europtics Cherry Creek North store and try a pair on for yourself soon. Your vision isn’t a simple matter of optics. Vision consists of optics, plus neurological processing. The light converging on the retina must be interpreted, and the brain processes those signals. It has been shown that even in cases where a clear image is focused on the retina that neuro-adaptation may still be required if there are inherent optical aberrations within the visual system that the brain cannot accept. In order to provide you with the best possible visual acuity, both your refractive error and wavefront error must be accurately measured… and corrected. Refractive errors, also known as low order aberrations (LOAs), are determined through traditional measurements and communicated in terms of power (sphere and cylinder) and location (axis). In comparison, wavefront errors, which are comprised of the combination of LOAs and high order aberrations (HOAs), are measured with an aberrometer and communicated in terms of orientation and magnitude. Basically, every eye (including emmetropes) has some degree of measureable distortion (aberration), both LOA and HOA. While a conventional sphero-cylindrical vision correction eliminates LOAs, a wavefront-guided vision correction minimizes the blur that results from the combination of the LOA and HOA. Europtics is proud to be one of the first in Colorado to have the new .Profilerplus® three-in-one system by ZEISS. This complex device will sample around 1,500 points across the entire pupil aperture. With this additional information, the eye doctors at Europtics can create customized prescriptions that address not only refractive error (LOAs), but HOAs as well. The i.Profilerplus® three-in-one system by ZEISS makes creating a wavefront-guided refraction simple. Using the wavefront aberrometry data captured by the i.Profilerplus, the ZEISS VoluMetric merit function calculates the wavefront refraction with sphere and cylinder powers. Then use the i.Scription® software to combine the subjective refraction with the ocular wavefront aberrometry data to create a customized prescription that is accurate to 1/100th of a diopter, accuracy virtually unheard of previously. Call and schedule an exam in our new Cherry Creek North store today (303-321-3000) and let us show you this remarkable technology to help us prescribe the best pair of glasses you have ever worn.